I joined Fluid, Inc. in January 2013 for a three month project to work with a major electronics company building a luxury shopping experience upon their Smart Televisions. The goal of the project was to breathe life into a pitch through an intense rediscovery and concept period. Fluid had worked with the client in the preceding year, yet the result was not accepted. As such, Fluid needed to redesign and rebuild the pitch, prototype, and presentation of the proposed solution. As part of a dynamic User Experience team, we worked diligently through weekly sprints of Information Architecture, User Experience, & Product Design. Working together with the Visual Design, Technology, Project Management teams, we assembled a fully functional Smart TV prototype. We were posed with many ways of “checking out” on a T-Commerce platform via: a new account, an existing account, a guest checkout, and a mobile/tablet payment. 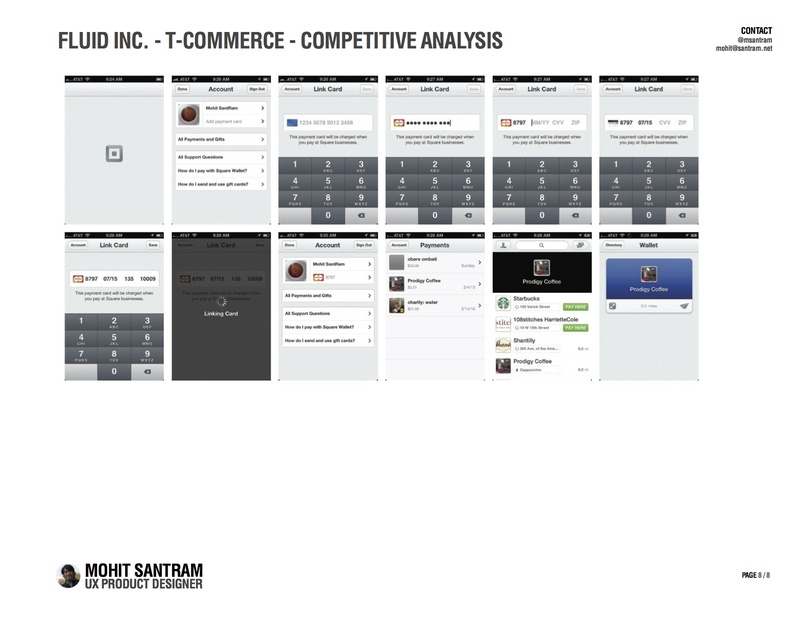 The challenge was to provide a consistent experience on each platform and account type. 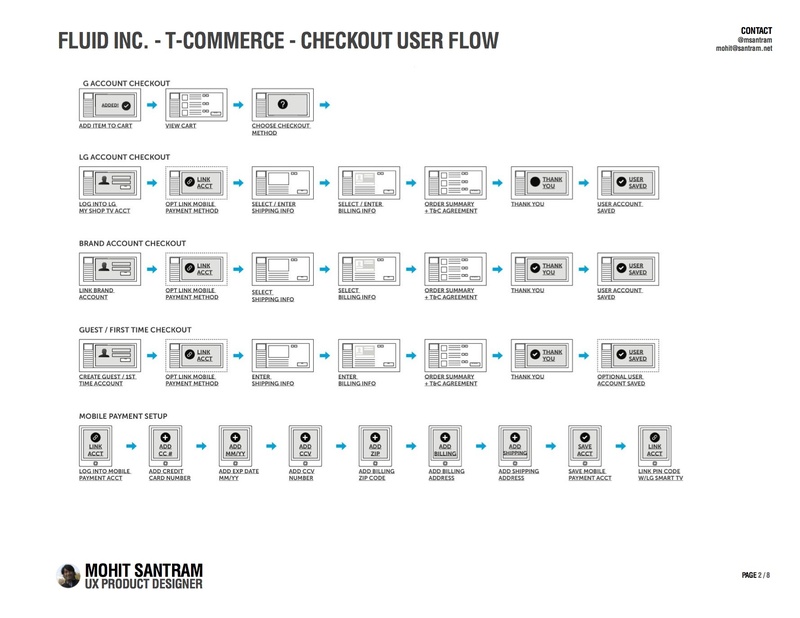 This Checkout User Flow simplified the process so everyone could easily understand the complexities of each checkout path. Television User Experiences are traditionally lean back. Users browse content and engage on a limited basis. Within our proposed T-Commerce Smart TV shopping platform, users could browse through luxury brand content. Product offerings could be viewed by vertical groupings or a mix of brand products. 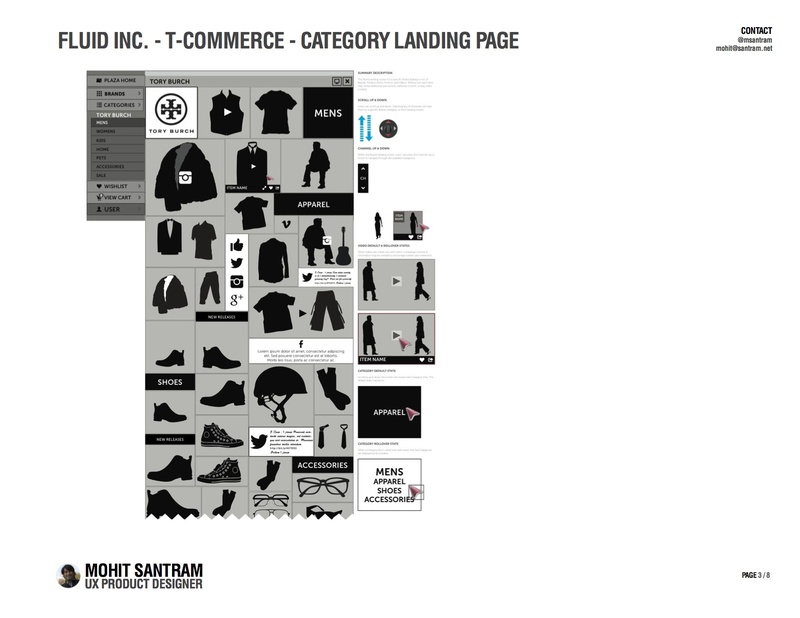 This page details Men’s goods grouped within apparel, shoes, and accessories subcategories. Using a remote control, users could scroll through content and drill down to a specific product page. 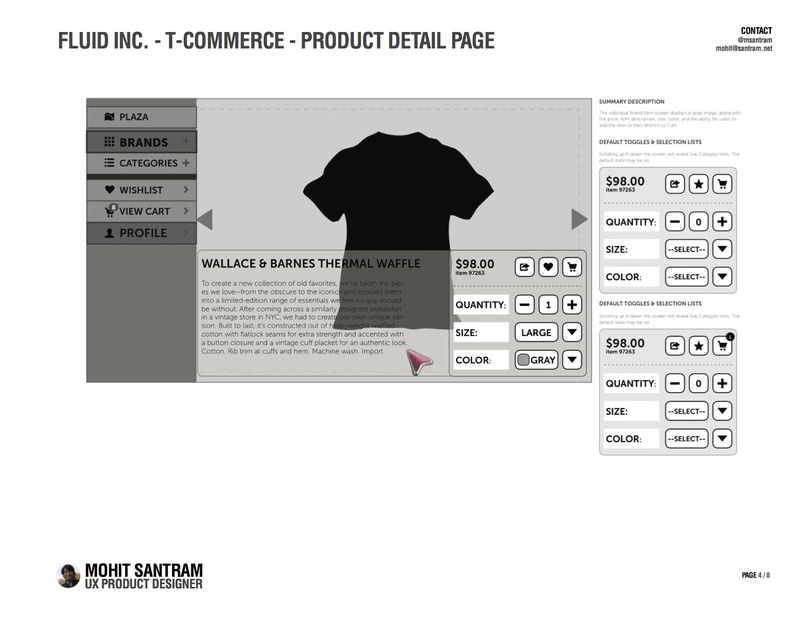 This Product Detail Page incorporates all the information that users traditionally see within an online offering. However the screen size of their Smart TV allows the user to congregate with additional viewers and browse through goods. The attention on this page is devoted to the product image, with the ability to see other product views and then select quantity, size, and color. 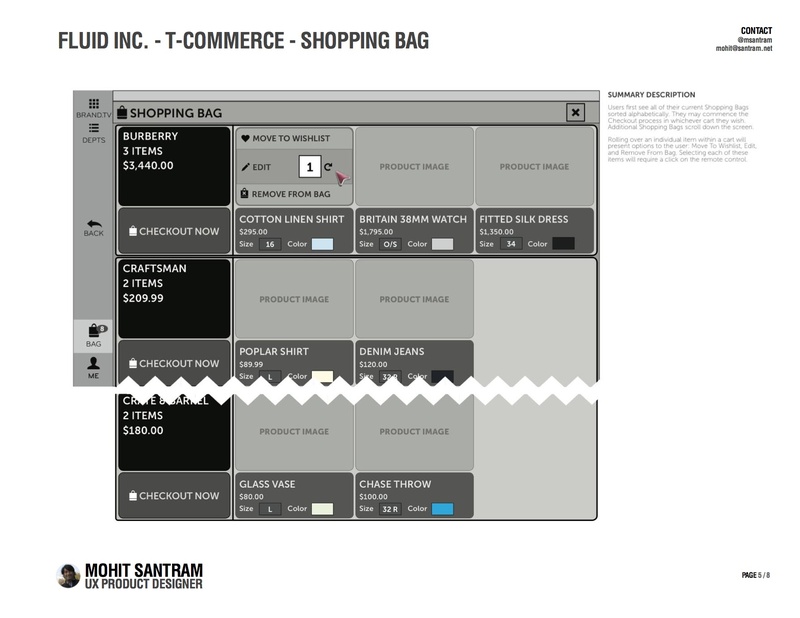 We imagined what the Shopping Bag experience would look like on a Smart TV. Considering the aspect ratio of the items on screen, and the complexities of navigating with a Nintendo Wii-like remote control, we needed to make sure click targets were large enough to accommodate all users. 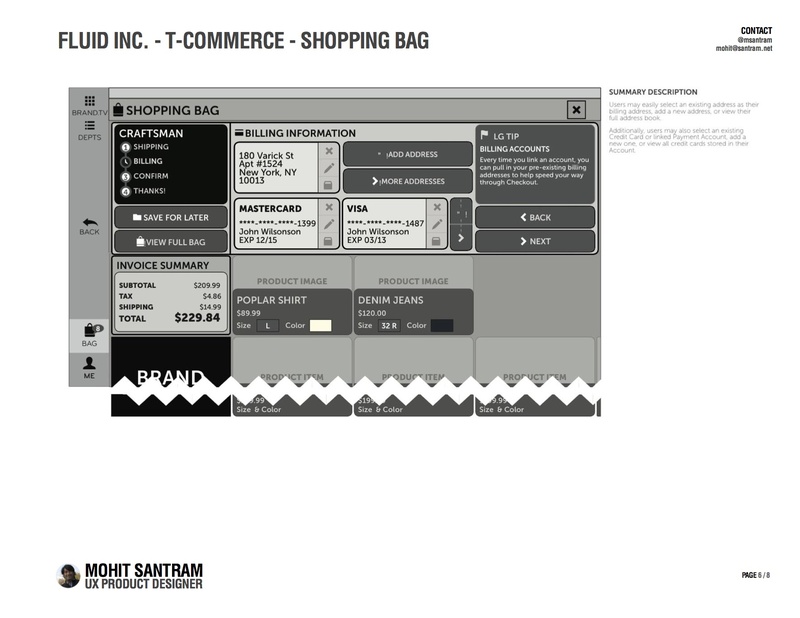 This page displays individualized shopping bags from three possible luxury brands. Users would be able to check out all bags at once or one at a time. Completing the checkout process on web browsers has clearly been optimized by many. Checking out on a Smart TV is a more difficult process because of many security, compliance, and credit card challenges. In this example, the goal was to imagine what the checkout process could look like on a Smart TV, and more importantly what we could improve. 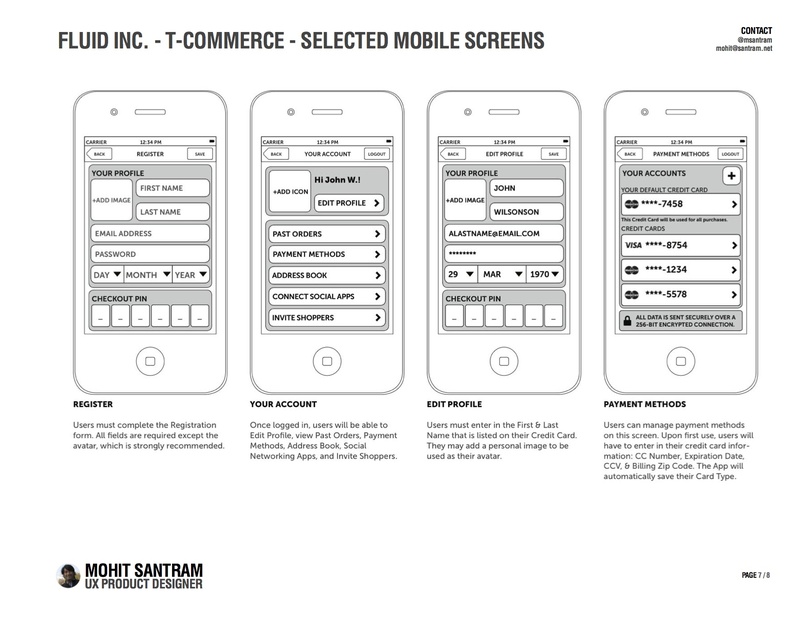 Within the confines of a mobile device, optimizing the amount and order of displayed content was imperative. These selected screens are examples of a User’s journey through Registration, Account, Profile, and Payment Management. Through development of these screens, I learned just how valuable a database of existing User Accounts could be for a mobile experience. We looked at many different checkout processes. Square does a tremendous job with optimizing this experience. Our Competitive Analysis took into consideration many aspects of the best experiences in the wild. After multiple check ins with the client, we conducted extensive User Testing sessions with prospective end users. Our goal was to qualify the assumption we had made during our design process. After analyzing our findings and results, we presented our Experience Design Documentation, Prototype, and User Testing Analysis to the client for their review.